It’s time once again to recognize a select group of artistic achievers in New Mexico. A ceremony and exhibition honoring the recipients of the 2013 Governor’s Awards for Excellence in the Arts take place Friday, September 27, in Santa Fe. In the September issue we celebrated the work of a handful of this year’s honorees, including Jenny Vincent, a Taos folk musician and cultural preservationist; painter Darren Vigil Gray and ceramist Frank Willett, both of Santa Fe; and the Silver City–based Mimbres Regional Arts Council. In this issue we salute painter and furniture maker Jim Wagner, of Taos; painter and printmaker Edward Gonzales, of Rio Rancho; and potter and arts educator Aria Finch, of Roswell. Taos artist Jim Wagner is a living legend among admirers and collectors of work from what has come to be known as the “Third Chapter” of the celebrated Taos Art Colony, along with R.C. Gorman, Woody Crumbo, and Fritz Scholder. Under the mentorship of—and no-nonsense critiquing from—Earl Stroh, Andrew Dasburg, Louis Ribak, Bisttram, and other notable Taos artists, Wagner began to craft an autobiography in wood, canvas, and paint, one that to this day is as much about Taos as it is about Wagner’s refreshingly unassuming place in it. 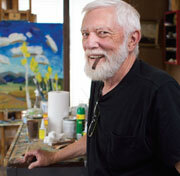 From first place at the Helene Wurlitzer Foundation Purchase awards in the 1968 Taos Art Association Awards Show, to the recently closed exhibition Jim Wagner: Trudy’s House at the Harwood Museum of Art, Wagner’s success has had as much to do with his unpretentious approach to painting and sculpture as with his longevity in a creative pursuit that has left its fair share of hardworking strivers by the wayside. Wagner also pioneered the painted-furniture movement in New Mexico in the 1980s, a popular decorating style based on Taos furniture from the late 1800s that has since become synonymous with contemporary American folk art. Wagner’s creative passions, however persistent, were frequently challenged by struggles with inner demons, including violence, substance abuse, and addiction. He spent nine months behind bars at New Mexico State Penitentiary for assault with intent to commit a violent felony before being pardoned by governor Toney Anaya in 1978, and he had to cope with the devastating loss of his teenage son in 1980. Wagner’s quirky, colorful abstract painting style often mirrors a delicate balancing act between the beauty of the Taos landscape, people, adobe architecture, and wildlife, and the emotional chaos that sometimes simmers within him. Wagner now has more than 36 solo exhibitions and seven group exhibitions to his name; his work can be found in the permanent collections of the Harwood Museum of Art, the Roswell Museum and Art Center, and the Capitol Collection of the State of New Mexico. After 20 years with the Parks Gallery in Taos, Wagner is now represented by the Rancho Milagro Collection (ranchomilagrocollection.com), a Taos gallery of new and vintage fine art and furnishings from the collection of Ed and Trudy Healy. The collection was overseen by Stephen Parks, owner of the Parks Gallery and author of the art book and biography Jim Wagner: An American Artist (Rancho Milagro Productions, 1993), until his death in August. At the end of World War II, one-year-old Edward Gonzales and his family moved from Los Angeles to New Mexico. Money was tight and their Albuquerque home had no running water, but Gonzales found solace in novels, history books, magazine illustrations, comic books, and colored pencils—as well as the rich heritage of his family and his surroundings. Varying his technique over the years from the rigorous grisaille (monochromatic) method popularized by fresco masters such as Giotto and Andrea del Sarto, to the multihued, color-washed style of alla prima (wet paint applied to wet paint) used by Baroque masters such as Diego Velázquez, Gonzales counts the work of Norman Rockwell as a top influence on his approach to figurative painting. Although his work may appear straightforward at first glance, many of his paintings depicting Hispanic lifeways—both new and historical—are rife with cultural symbolism and allusions to dreams. That love of the symbolic is a trait he shares with his most inspirational role model, the late Taos woodcarver Patrociño Barela. As a passionate master printmaker, Gonzales also burns and prints intaglio plates on his own press. 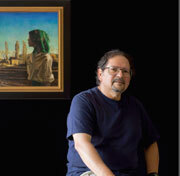 Along with founding the Organization of Hispanic Artists and overseeing the inaugural Contemporary Hispanic Market in Santa Fe in 1990, Gonzales co-authored Spirit Ascendant: The Art and Life of Patrociño Barela; participated in the New Mexico Public Schools Artist-in-Residence program, creating 28 murals and art-literacy projects throughout New Mexico; illustrated Rudolfo Anaya’s children’s books The Farolitos of Christmas and Farolitos for Abuelo; and received the 2006 Outstanding Latino Cultural Arts Award from the American Association for Hispanics in Higher Education. “Once you touch the clay, that’s it—you’re addicted,” says Aria Finch, founder of the 35-year-old Pecos Valley Potters’ Guild. A tireless arts educator who moved to New Mexico in the 1970s, Finch says she first became involved with the Roswell Museum and Arts Center (RMAC) by pure chance. A conversation with a friend who told her where she could kiln-fire her own ceramics led Finch to RMAC, where she subsequently applied for a position as a ceramics teacher “with one of my kids perched on each of my legs.” What began as a tiny, outdated studio at the museum and a class of only two students has blossomed into a ceramics program that now houses three modernized studios. Finch’s passion for the arts, organizational skills, and fundraising savvy have helped the Pecos Valley Potters’ Guild raise hundreds of thousands of dollars for the RMAC and its artist-in-residency program. 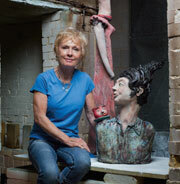 In 1998, with money raised through the popular annual Soup ’n Bowl benefit organized by the guild (soupnbowl.com), a state-of-the-art ceramics studio was constructed for the RMAC’s Patricia Lubben Bassett Art Education Center. Some 780 schoolchildren now visit the studio three times each year, gaining hands-on knowledge about ceramic arts.